All notecards have a stitched insert that makes them into a little booklet. Perfect for keeping in touch with your favorite people. The insert picture is complimentary to the picture on the front of the card, but not the same as the front of the card. Packaged in groups of 6 and sold for $15.00. 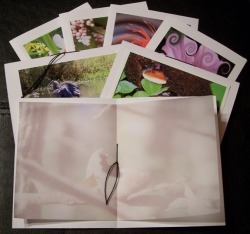 *Cardstock used may also be colored to compliment the pictures.